This was the previous question I solved today. 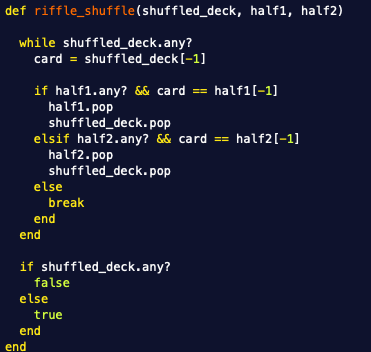 Write a method to tell us if a full deck of cards shuffled_deck is a single riffle of two other halves half1 and half2. We'll represent a stack of cards as an array of integers in the range 1..52 (since there are 52 distinct cards in a deck). Logic was to get the shuffled deck and check if the last card in shuffled deck belongs to the top of half 1 of half 2. -do while loop until shuffled deck is empty. -pick a card from the shuffled deck - check if it's the top card of half 1 or half2. -if it matches top of half1 - pop it from half1, pop from deck. -else if is top of half2, repeat. 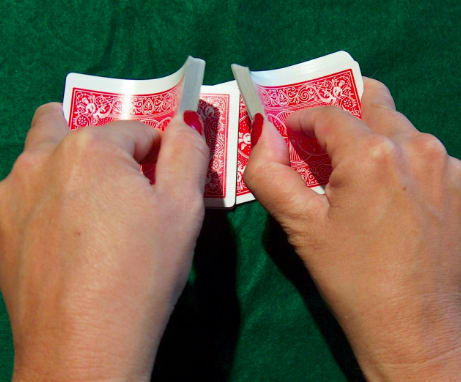 -if the card does not match the top of either halves, it's not a single shuffle. I think I could improve this. I am not sure yet what the complexity of using pop is. If its always O then this logic is good. But anyhow since the max deck of cards is always 52, change in performance wont make much difference even with better code than this.